Count on big learning fun with a singing till friend that counts, talks and sings - 20 shopping items included! 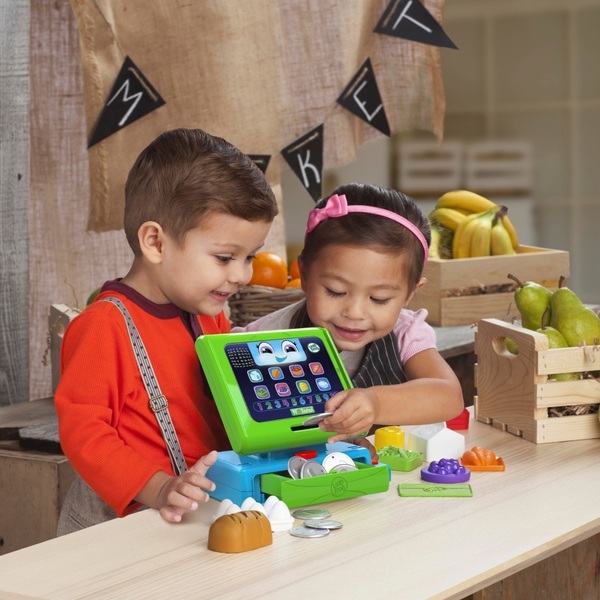 Stock up on counting skills & pretend play with a 20-piece shopping set! Stock up on counting skills and role play fun with the Count Along Till. Little shoppers will have bags of fun with a 20-piece set that talks, sings & counts with a friendly animated face! Little shoppers can run their own shop from the moment their singing till powers on and announces "Open for business!" 8 yummy pretend food items correspond with buttons on the till's touch screen. Press a button to hear the name and colour of the food, a verse of a shopping song and fun sounds like the crunching of egg shells followed by "Oops, guess we'll make an omelette!" Press the number buttons 1-10 to hear the numbers and a counting song. Play with the Count Along Till as the cashier or the shopper. Swipe items across a scanner that really beeps, then push the total button to hear the number of coins to insert. Be careful not to insert too many: "An extra coin? Thanks for the tip!" Finish by swiping a shopping card to hear helpful phrases like, "Did you bring your own bag today?